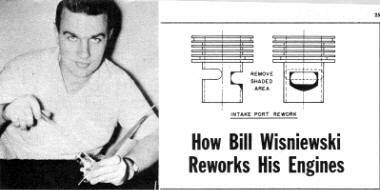 Bill Wisniewski was a world-class competitor in the control line realm back in the 1950s and 1960s. His "Pink Lady" series of models were particularly successful. 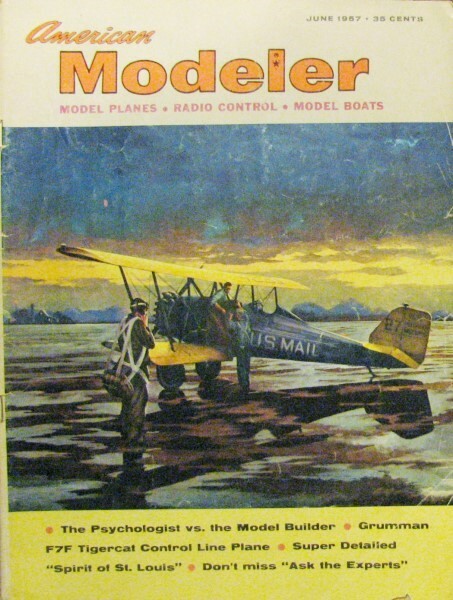 Website visitor Barrie H. requested that I post an article from the June 1957 American Modeler on how Bill reworks his engines for maximum performance. "The engine as you receive it is a powerplant worthy of your best efforts. However, it is built as good as machinery can make it and requires a personal touch to get the most out of it." Special Editor's note to newcomers: The following information is "hot stuff" for model plane competition flyers. Every speed contender will welcome Bill's re­port. But we do not recommend that unskilled or novice modelers attempt this hop-up procedure. Remember, your purchase guarantee is void on any engine the moment you start reworking it! I have been asked many times what the experts do to an engine which is to be used for racing purposes. I have been working with speed models and engines for quite a few years, and I pass on to you what information I have acquired. This deals mainly with the K&B-Allyn "Torpedo" engines, but can be applied to other makes as well. First a few words about the engine as it comes from the factory. The engine as you receive it is a powerplant worthy of your best efforts. However, it is built as good as machinery can make it and requires a "personal" touch to get the most out of it. Now we start to work. Disassemble your engine and lay parts out on a clean surface. The cylinder and head on a .19 or .15 should be turned down in a lathe to the same diameter as the top surface of the crankcase (.19 is 1.125" and .15 is 1.000"). The .29R is already in this condition so no turning is required. You will notice that the ports in the sleeve have round corners. In order to insure a free flow of fuel into the cylinder we file the intake port so that the corners are square, being careful not to raise the top. The lower edge of the intake port is beveled to a sharp edge. Do not touch the exhaust port as the round corners help keep the piston in line. Remove all burrs and polish intake side of sleeve. Clean thoroughly and push the piston up through the sleeve until the flat part of the piston is even with the bottom of the exhaust port. Check to be sure the baffle is the correct height. You should be able to see the top edge of the intake port over the top of the baffle. If you can't see the port file or grind the top of the baffle until you can. The new style .19 (with rounded ports) and the .15 have a low compression ratio and should be raised by facing the top of the cylinder (.030" for .19 and .020" for .15) on a lathe. Piston and cylinder should be carefully hand-lapped using a fine grade of lapping compound (auto rubbing compound such as DuPont # 7 with oil works good). For my purposes the piston and cylinder as they come from the factory are set up a little too tight for free running. Be careful with this operation or you will not have any compression when you are through. It is better to leave it a little bit tight and run it. If it freezes at high rpm lap it again. Clean piston and cylinder thoroughly with soap and hot water, dry them, and coat all over with oil. The crankcase is next. File the exhaust stack flush with fin diameter to fit in cowling. Tap the needle valve hole with a 10-32 tap. You will notice a fairly heavy burr caused by flash from the die at the bottom of the bypass. This should be removed and the bypass polished. The venturi is filed at an angle and excess material removed from the inside to fair to a thin edge around the top and polish. Check the main bearing for fit with the shaft. The shaft should be a free running fit-that is about .002" clearance. The crankshaft port should be cleaned up with a small grinder. Grind web in port away to the edge of the port. Then check the port opening. The port should open 28° after bottom dead center and should close at 45° after top dead center. You may have to grind away the port to get the proper opening and closing. All engines are not the same - As I said before, the engine cannot be made any better than the machines that make them. This is an important step in reworking your engine. 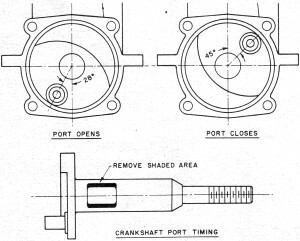 After obtaining the desired timing polish the crankshaft journal and crankpin to remove any slight burrs that may be there. Assemble engine and run it until you are sure it is free. The fuel I have been using is as follows: 15% castor oil, 5% polyoxide oil (which is available from outboard boat racing shops), 10% nitro-benzine, 55% nitro-methane, 15% methanol. This should be mixed at least one week before using and stored in dark bottles. This procedure coupled with the fuel has given very good results in my "Pink Ladies." Hope it does the same for you.